WASHINGTON — There is no indication that Trump Tower was “the subject of surveillance” by the U.S. government before or after the 2016 election, the top two members of the Senate intelligence committee said Thursday, directly contradicting President Donald Trump’s claims. Burr and Warner were among eight senior congressional leaders briefed Friday by FBI Director James Comey. House Speaker Paul Ryan addresses Trump’s wiretap claims. 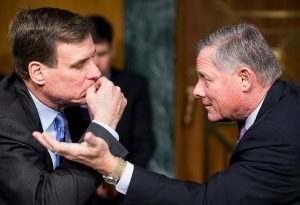 Left: Vice chair Sen. Mark Warner, D-Va., left, and chairman Sen. Richard Burr, R-N.C., confer Jan. 10 before the start of the Senate (Select) Intelligence Committee hearing on "Russian Intelligence Activities." Burr and Warner said Thursday they saw no indication Trump Tower was under surveillance before or after Election Day. Photo by Bill Clark/CQ Roll Call.